These games can be enjoyed on many levels -- As light party games, learning games, time-passers, or strategy games. They encourage creativity and direct human interaction! With a dry-erase pen and your EYES CLOSED, how well can you evade tacklers, pass to receivers or execute kicking plays? That’s the CHALLENGE of Out of 'Sight' Football ! But beware your opponent’s hidden blue dots - Linebackers! They can Stuff Runs, Intercept Passes, Cause Fumbles, or Blitz when you least expect it !! "Innovative, with a classic feel"
Field is laminated (3 mil) for easy erasure. Includes: Kickoffs, Punts, Field Goals, Sacks, Safeties, Blocked Kicks, Fake Kicks, Hurdles, Laterals, Run/Pass Blocking, Slo-Mo Replays, Wind and Weather Conditions, a Playbook with fifteen offensive play choices plus multiple play variations. Game weighs only 1.4 lbs and is easily portable. Folds into a box 16″ x 10.5″ x 1″. Above is a running play from left to right that was stopped by a red obstacle at the 28 yard line. White obstacles do not stop plays that have already gained 5 yards - A key rule that opens up excitement! The 3 blue dots are movable defenders (Linebackers) that are "HIDDEN" BEFORE EACH PLAY on a hinged, see-thru overlay. Defensive options are INFINITE because the blue dots are INDEPENDENTLY MOVABLE and stick securely to the see-thru overlay by Static-Cling! DETAILED FOOTBALL STRATEGY! Play calling and defensive placement are the keys to victory. Of course a steady hand helps too, as does a little luck on fumble recoveries. Here's a Live Action Demo of our Basketball game . . . Above: Top half of Playbook -- More plays include REVERSE, QB ROLLOUT, SCREEN PASS, HALFBACK PASS, HAIL MARY / FLEA FLICKER, QB SNEAK ...or design your own! Upper Decks and other items for customizing the stadium are printable from the Out of Sight Football website under Extras. 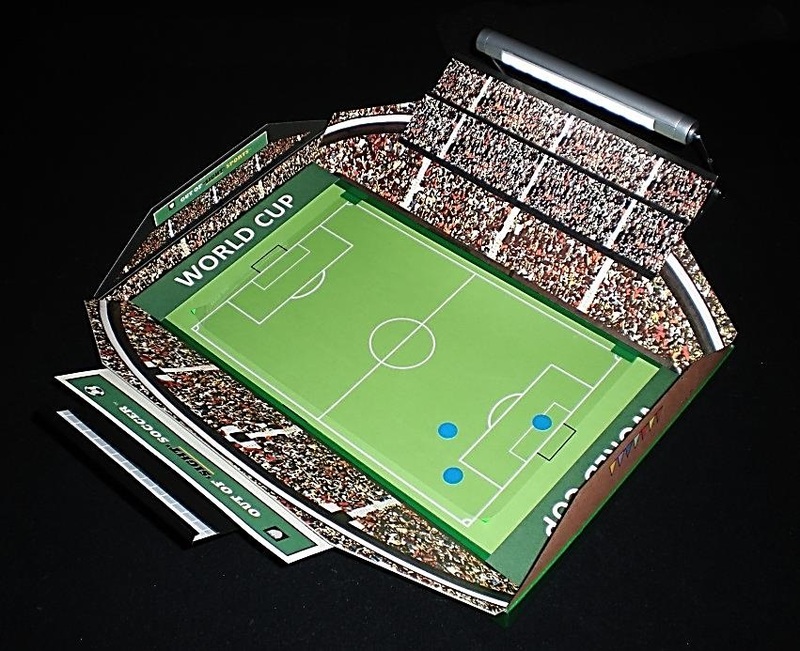 Print them onto cardstock and modify them to replicate your favorite stadium. Custom upper decks appear in the first two photos below. A pledge of $200 or more includes a PHOTO OF YOU in the large middle Sky Box. 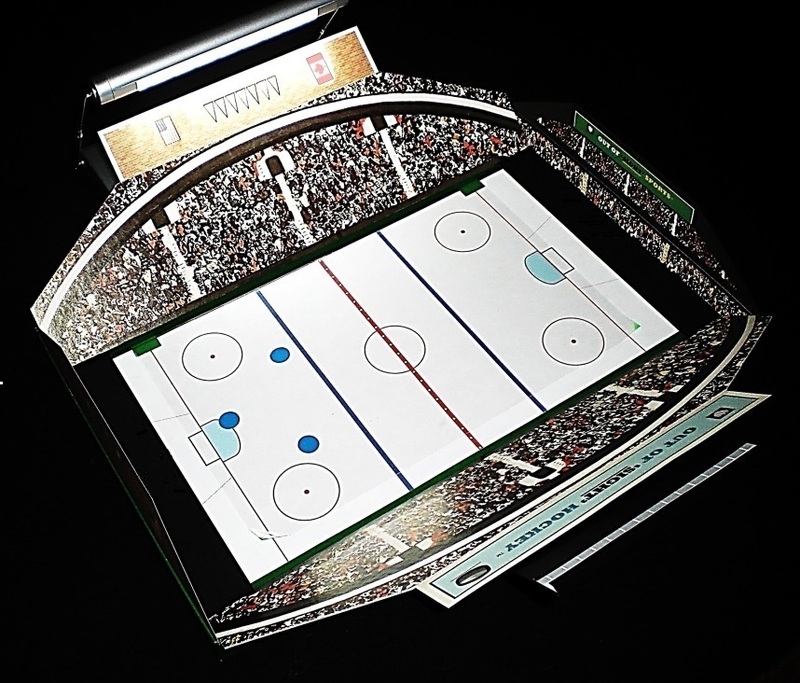 With laminated Gameboard Inserts for Basketball, Soccer, Ice Hockey & Australian Rules Football! 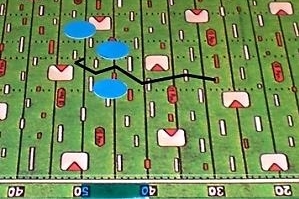 Pictured below are other sports with gameboards placed over the football field (and under the clear overlay with the blue dots). In each sport, the blue dots are independently movable defenders. In the first photo below, note the large (10.5" x 1.2"), removable, team nameplates (on cardstock) behind the end lines. Nameplates of your favorite team(s) (in original fonts) or national flag (as in the Olympics) are included with the rewards. Insert them under the sides of the stadium. American Football nameplates are also 10.5" x 1.2". Hint: With a personal computer you can create your own nameplates! Out of 'Sight' Sports - "So Real, you can almost sell Tickets!" Portable Stadium Lights are available from homedepot.com and walmart.com. Larger lights are available from footballfigure.net. For the future: Our patented concept can apply to any scenario where a player with his eyes closed tries to either evade, or hit, objects printed on a game board while another player tries to stop him with movable symbols hidden on an overlay. Cops and Robbers, Trying to flee a Haunted House, Chipmunks stealing Golf Balls ... the possibilities are endless! We lovingly assemble each game ourselves, and we already have the parts for a few hundred games which is why our pledge goal is low. Barring unforeseen delays, we should be able to ship all games by the holidays! Note: Add $15 for shipping to Canada. Outside the US and Canada add $25. Also, another sport can be substituted for Football in the below rewards. A copy of the Basic Football game and two end zone nameplates of your favorite team. A copy of the Deluxe Football game and two end zone nameplates of your favorite team. A copy of the Deluxe Football game and two end zone nameplates of your favorite team. Plus a gameboard insert and rules for your choice of either Basketball, Soccer, or Ice Hockey and two end line nameplates of your favorite team in that sport! A copy of the Deluxe Football game and two end zone nameplates of your favorite team. 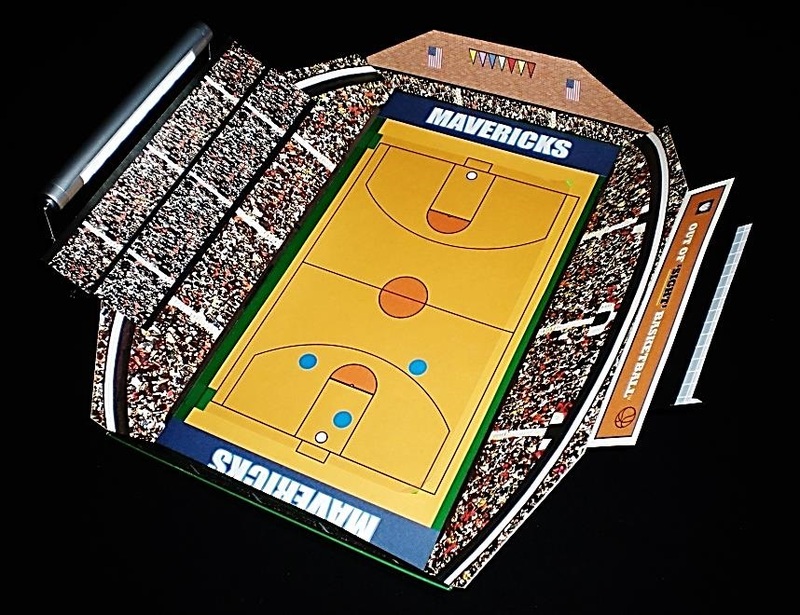 Plus gameboard inserts and rules for your choice of two more sports (Basketball, Soccer, or Ice Hockey) and two end line nameplates of your favorite team in each sport! A copy of the Deluxe Football game and two end zone nameplates of your favorite team. Plus gameboard inserts and rules for Basketball, Soccer, AND Ice Hockey and two end line nameplates of your favorite team in each sport! A copy of the Deluxe Football game and two end zone nameplates of your favorite team. Plus gameboard inserts and rules for Basketball, Soccer, AND Ice Hockey and two end line nameplates of your favorite team in each sport. Plus a PHOTO OF YOU prominently centered in a Sky Box overlooking the stadium! A copy of the Deluxe Football game and two end zone nameplates of your favorite team. Plus gameboard inserts and rules for Basketball, Soccer, AND Ice Hockey and two end line nameplates of your favorite team in each sport. Plus a PHOTO OF YOU prominently centered in a Sky Box overlooking the stadium. Plus a one hour phone chat with Erik, the inventor!